With less than a week to go our intrepid Rookie Racers, Gary and Charlie, have been doing their final runs, checks, tweaks and even paint jobs for the East Midlands Racing Associations (EMRA) ‘Bridgestone 500’ Championship. Here’s a quick catch up with the guys to see where their heads are at. “The build-up over the winter has been long, round 1 seemed light years away but here we are, a couple of days to go and the nerves are beginning to tingle, by Sunday morning I will be shaking like a shitting dog. However, I think Charlie will be more nervous as his bike blew a seal whilst testing last week, so emergency repairs were needed and our trusty entourage of mechanics, namely Lezzo, came to the rescue. It’s a good job we have friends who are decent with spanners as it’s close competition between Charlie and I as to who is the world’s most incompetent mechanic. Jeremy Clarkson has nothing on us. 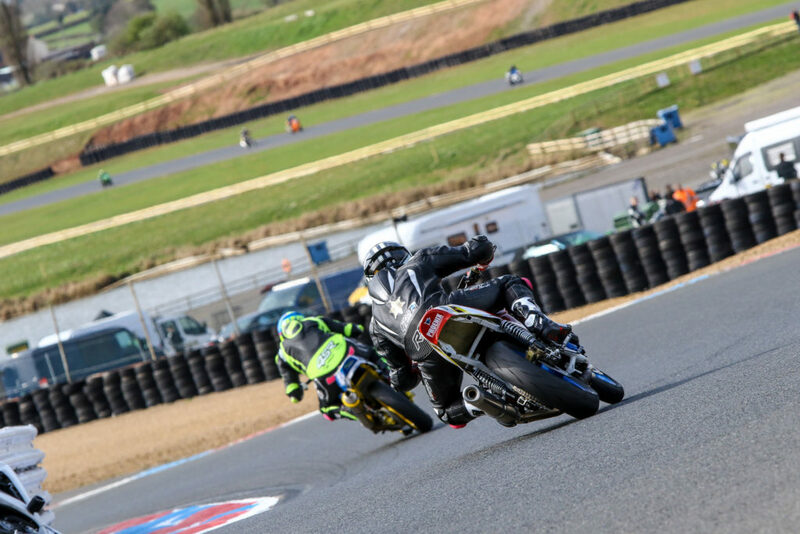 “I have been approaching the start of the season with my fingers in my ears, la-la-la-la’ing the inevitable, Round 1 at Mallory Park on April 7th 2019. 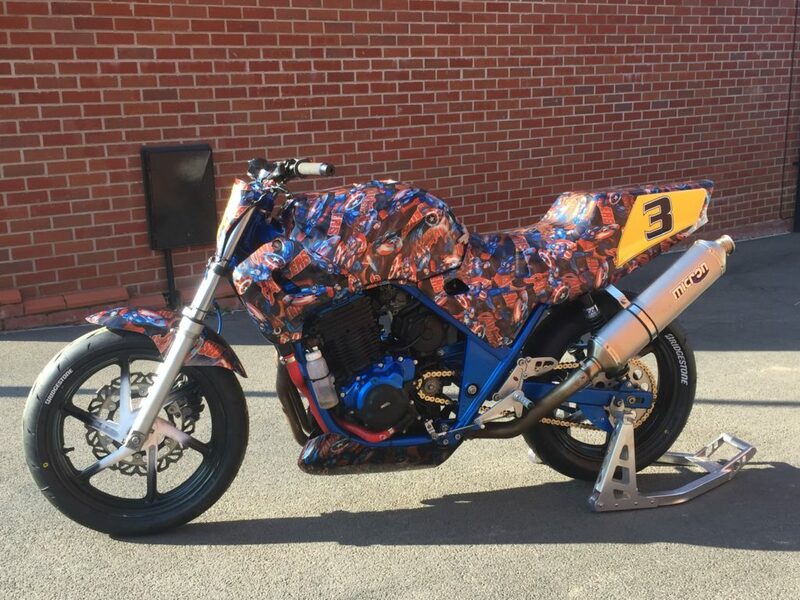 I finally got the bike for a shakedown at Mallory last Sunday (31st March) for a No Limits Track day. I left my house at 4am Sunday Morning in my old van with my old bike in the back and watched the sun come up as I headed north. There was a certain romanticism about the experience, it was just me in my van, with my bike heading off for the start of a season long adventure. The shakedown did what it was supposed to; spot problems. I had already identified the first niggle myself having put the new front mudguard on back to front – this is due to the fact that I am a genius. But then after a confidence boosting first session a boot covered in oil had the alarm bells ringing. Fortunately as our Gary has stated Lezzo was on hand to spot and temporarily rectify the situation. A seal gone, just one poxy seal that would have quashed any racing for me this coming weekend had it not been spotted. “It is less than a week now till the red lights go out and rumor has it there’s almost 50 piggies entered into round 1. Yes, 50 CB500’s! There’s so many the organisers are running 3 groups; A, B and C with Group A racing B, B racing C and C racing A. 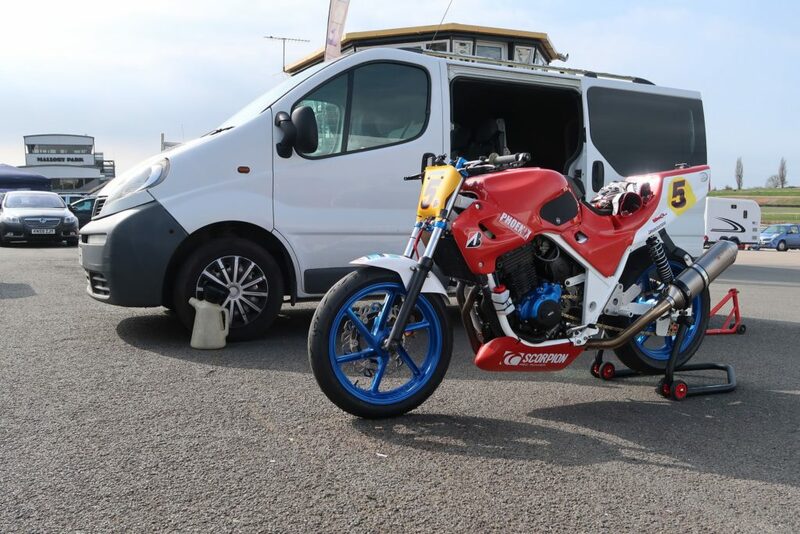 50 bikes in a mile at Mallory is going to be busier than the M25 on a bank holiday weekend and its probably going to be down to luck if I get a decent lap time in, or anyone does for that matter. What I want to know, though, is where have all these riders come from? I have seen on the EMRA Facebook page that many riders have completed their ACU license courses so it looks like there’s going to be plenty of novices out there. This is great for racing and for the club as its new riders taking the plunge into racing, and they’re choosing EMRA to do it. “My bike is in good hands with Lezzo, nothing to worry about there. 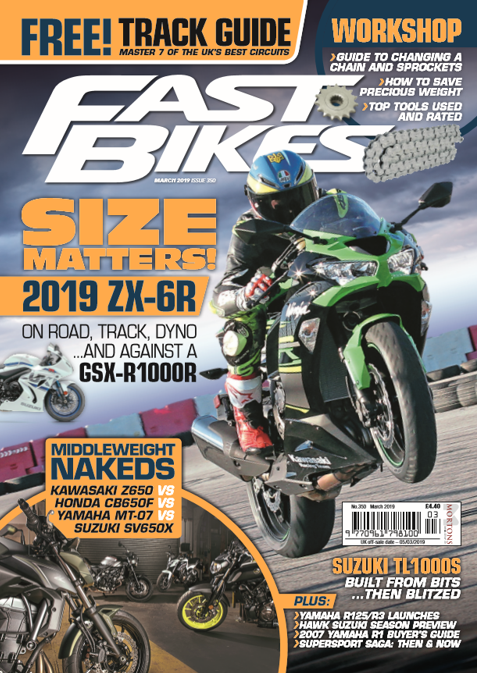 It’s a good one to, according to No Limits Instructor and fellow CB500 rider Chris Smith, stating that the straight line speed of my bike is comparable to his. 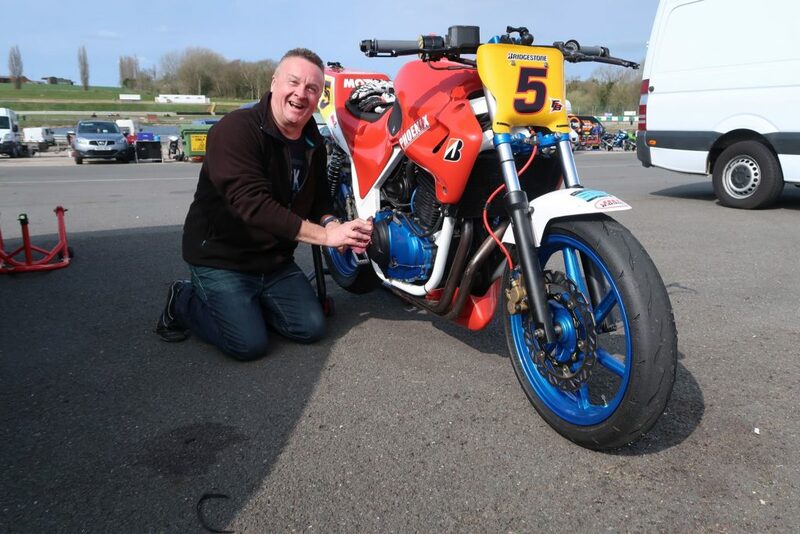 Chris, who like Lezzo helps Gary and I out of the goodness of his heart and a love for the CB500, followed me around Mallory stating that my lines were pretty good too! Now, my real worry and nerves come from a lack of race-craft. I am deserved of my ‘Orange Vest’ and despite having Fast Bikes on my leathers, it puts me no-where near the capability of our test crew. I am a 44-year-old adman with a passion for giving it a bloody good go and would be gutted if my lack of experience ruined another rider’s raceday. If you are competing in round 1, don’t forget to collect your goody bags when you sign on. As for you Marshals, there’s something for you, too: we are sure the rest of all the classes at EMRA will join us in a massive “thank you in advance” for your time and effort in allowing us to do what we love. Huge thanks to each and every one of you.